Throughout the Region, victims were remembered and honoured. In Slovenia, people at a candle-lit mass in Ljubljana Cathedral reflected on loss and grief. 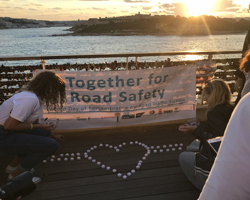 In Malta, citizens took part in a remembrance walk while carrying candles and images of loved ones lost to road tragedies. In Croatia, people lit candles by roads where crashes had happened and in windows across the country in memory of victims. The central event of the day took place in Marija Bistrica – a Croatian national pilgrimage site that hundreds of thousands of Catholic pilgrims visit every year. In Turkey, a gallery exhibition with the pictures and names of victims highlighted their individuality. This visual story put faces to the numbers in order to convey the magnitude of road traffic injury, which is often so difficult to conceptualize. NGOs played a crucial role in orchestrating WDoR events across the Region. In Slovenia, Varna Pot (Safe Road) pushed for Vision Zero – a road traffic safety project that aims to achieve a highway system with no fatalities or serious injuries – during an event at City Hall in Ljubljana. In Georgia, participants in vigils organized by the Georgian Alliance for Safe Roads held banners with messages such as “Roads have history”, “Remember me” and “Slow down” to engage the general public. Awareness also spread beyond the grassroots level. Throughout the Russian Federation, spokespeople shared information about deaths and injuries, notified people of prevention tactics, and made promises of change. They did so on the streets as well as on the radio via the station “Komsomolskaya Pravda”, which reaches over 1.2 million Russians living in 400 settlements every day. In Turkey, various national film, television and sports celebrities lent their star power to advocate for safety on national roads. In Kazakhstan, Kyrgyzstan and Malta, press conferences ensured that information about road safety and preventive measures were disseminated far and wide. While the overall tone of the day expressed sadness and the urgency of change, events also acknowledged the often-thankless job of emergencies services. In Slovenia, Varna Pot held an awards ceremony for members of rescue teams and voluntary firefighters who dedicate their lives to helping people after road crashes. In several Russian regions, people made similar displays of gratitude to traffic inspectors who donated blood to individuals and the health services in order to aid their continued work. While emergency services are routinely strained to deal with road crashes, they continue to provide important care that prevents many injuries from becoming deaths. Through the day, events prompted authorities across the Region to prioritize road safety in national agendas. Diverse groups from all sectors of society also took part. In Georgia, for example, United Nations and WHO officials attended a vigil alongside members of the Orthodox Church, family members of victims, representatives of the police force and many other members of society. With road traffic injuries the leading cause of death for those aged 5–29 years in the Region, many events placed a particular emphasis on engaging youth. In Malta, Chris Goa Farrugia, Kaja Kobal and Jacob Smith were among several passionate youth advocates personally impacted by road trauma who shared their stories. They urged youth to step up and step forward for road safety, highlighting that young people are greatly affected by this issue and will inherit its challenges and solutions as future leaders. In the Republic of Moldova, schools, NGOs, the General Inspectorate of Police, National Road Patrol Inspectorate and the Ministry of Health, Labour and Social Protection participated in a flash mob to stimulate interest and discussion about road safety. An event was organized in Chisinau to identify and discuss the most important problems of streets and crossroads. The events of the day proved that society can pull together and generate momentum that must now be channelled into action. Although the day was a solemn opportunity to reflect and mourn, it also offered many symbols of hope. In Kazakhstan, people gathered around the Eternal Flame memorial in Almaty, which symbolizes peace and strength. In Georgia, trees were planted in areas where victims had died to signify new beginnings. Road crashes are not accidents, which are random, unpredictable and unpreventable events. They have risk factors, predictors and determinants such as speed, alcohol, and non-use of helmets, seatbelts and child restraints. Improvements in legislation, road infrastructure, vehicles and enforcement will make a radical difference in the amount of trauma that happens on our roads.